The St Andrew Parish Church, whose first Rector, the Rev. John Sellers, was appointed in June 1664, launched a year of activities on November 30, St Andrew’s Day, to celebrate its 350th anniversary. The Chief Celebrant and preacher at the launch Service was the Rt. Rev. Dr. the Hon.John Holder, Archbishop of the West Indies, while the Rt Rev. Dr. Howard Gregory, Bishop of Jamaica and The Cayman Islands, was the co-celebrant. Taking as his text 2 Corinthians 5:20, “We are therefore Christ’s ambassadors….” , the Archbishop spoke of the responsibility of the Church in ministering to the less fortunate in the society; and reflecting the love and mercy of Christ in an age where so many challenges confront mankind. He commended the St. Andrew Parish Church for its outreach programmes. These include the St. Andrew Settlement, which provides a range of social services to the inner-city community of Majesty Gardens; a home for girls aged 9-18 who are in need of protection; the St. Andrew Care Centre which offers support to street boys; and the St. Clement’s Mission where the spiritual and human development of residents of Kencot are being promoted through several initiatives. Archbishop Holder also reminded the congregation of the three pillars on which Anglicans base their understanding of God’s presence and action in the world – Scripture, Reason and Tradition. Other highlights of the Anniversary Service were the dedication of a new lectern, the cutting of special birthday cakes by Archbishop Holder and Bishop Gregory and the exchange of gifts. The Cathedral of St. Jago de la Vega in Spanish Town and St. David’s Church in Yallahs, St. Thomas, are also celebrating 350th anniversaries this year. 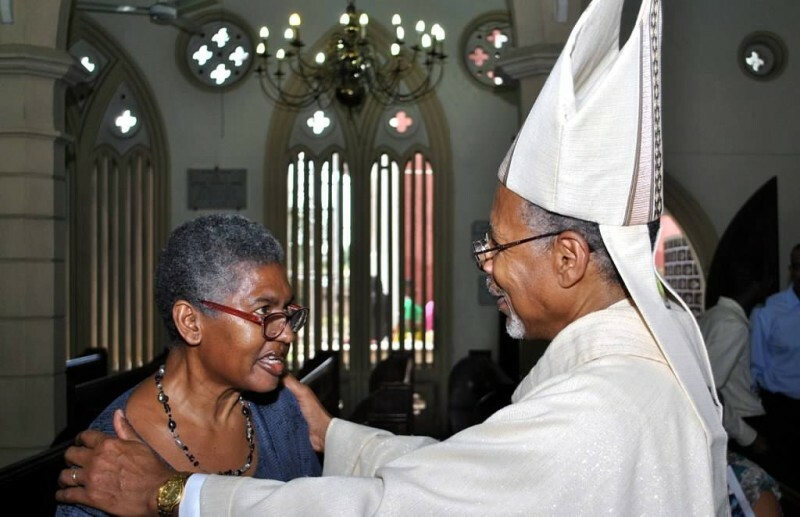 Archbishop Holder has a special message for the Rev. Vivette Jennings.